$3,000 = Fish & Win a Contingency Paying Event using your 2018 Skeeter Boat powered by a 225 horsepower Yamaha engine or larger and you will be eligible for $3,000 for a Win*. 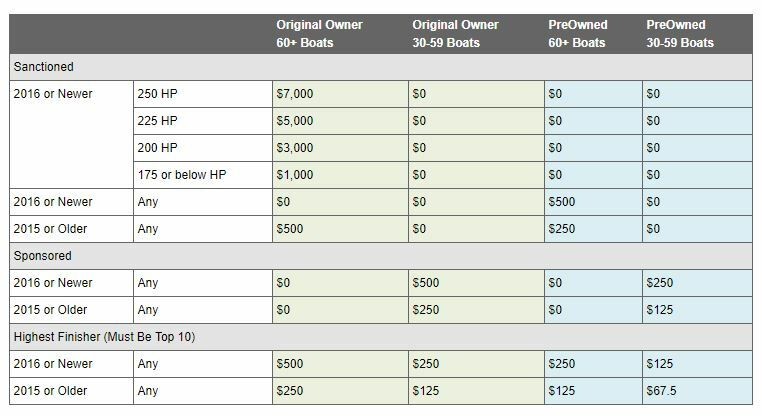 $1,000 = Fish & Win a Contingency Paying Event using your 2018 Skeeter boat powered by a 200 horsepower Yamaha engine or a 2016 Skeeter boat powered by a 225 horsepower Yamaha engine or larger and you will be eligible for $1,000 for a Win*. $500 = Fish & Win a Contingency Paying Event using your Skeeter boat powered by Yamaha and you will be eligible for $500 for a Win*. *Subject to Rules and Conditions. To be eligible for incentives you must register prior to participating in a Contingency Paying Event. Triton Gold offers the opportunity to reel in more cash bonuses than any other tournament contingency program, currently there are over 3000 Triton Gold sanctioned tournaments that offer the opportunity to win your share in over $20,000,000 in potential cash payouts! 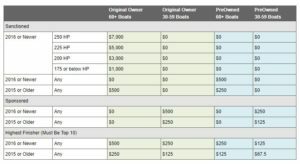 The lucrative Triton Gold tournament bonus program offers up to $7,000 to Triton Boats owners who win an eligible tournament. That's right. Get cash rewards for winning sanctioned tournaments with your Power-Pole shallow water anchor! We love winners and we want to reward you for making Power-Pole an important part of your advantage over the competition. Win up to $1,000 per tournament in the Fish and Win Program! Win up to $3,000 per year! You're going to fish anyway, and you need insurance. You might as well paid extra! Qualifying anglers can win an additional $200!